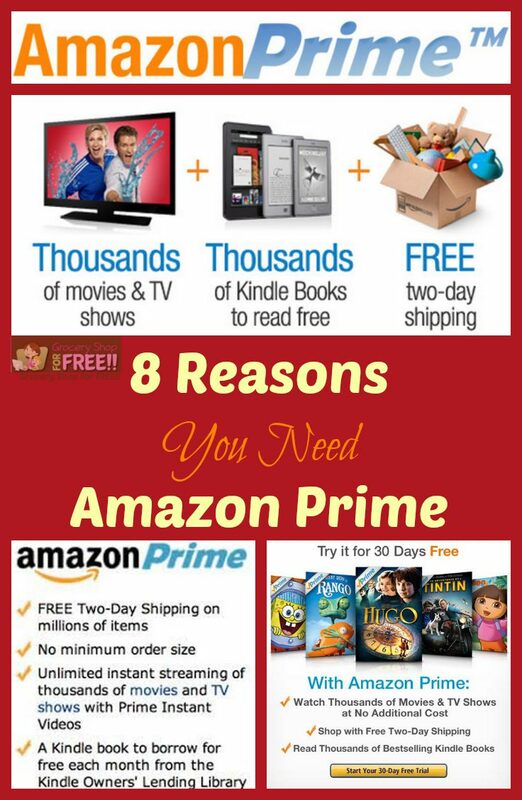 8 Reasons You Need To Get Amazon Prime! You are here: Home / Great Deals / Amazon Deals / 8 Reasons You Need To Get Amazon Prime! 1. FREE 2-day shipping on many items on Amazon. Pretty much anything that Amazon ships themselves gets you FREE 2-day shipping. You know how you will be going through Amazon and find something you really like only to find out the FREE shipping option is only available for those that order over $35 in eligible products? The shipping suddenly becomes FREE no matter what on those items with an Amazon Prime Membership! 2. Amazon Prime members get access to 1,000’s of FREE Kindle e-books in the lending library. You can borrow books with no due date to “return” them. Often, these are new releases and well known books. Why pay for books if you don’t have to and you can get them for FREE ? 3. Get new movies, video games and books delivered ON their release date. No more standing in line to get the hottest new releases! Simply wait for them to show up at your door on the date they hit the shelves! 4. A FREE streaming service. Do you have Netflix? If you love that, you are going to love Amazon Prime even more! You can get practically ANY tv show or movie with the streaming service from Amazon Prime. Considering what you pay for Netflix (it will soon go up to almost $9 a month for new members) you will get this streaming service for about 30% less per year with a much wider selection! 5. Cheap upgrades to 1 day shipping. When you need something and you need it now, this can get quite costly if you don’t have Amazon Prime. You could pay more than the item costs in most cases. With Amazon Prime, if the item is available for Prime’s FREE 2-day shipping, you can upgrade for JUST $3.99! You can’t afford to miss out on $3.99 1-day shipping! 6. You can share your FREE 2-day shipping with 4 other people! They don’t even have to be in your household! So, to cut the cost of Amazon Prime even more, see if you know any other Amazon fans and see if they will split the cost with you so you can all enjoy the free 2-day shipping. 7. Amazon Prime has some sub-categories like Amazon Mom which allows you to save 20% on Subscribe & Save stuff like toilet paper and diapers. Then there’s Amazon Student which is HALF the price of Amazon Prime and you get $10 for every referral you get to sign up! 8. You can get a FREE 30 day membership to try it out and see if you like it. There is NO obligation to continue after the 30 days. Cancel any time during the 30 days as well. So, what doe this mean for you? Give the 30 day trial a FREE spin and you can order many of the awesome deals we post right here on Grocery Shop For FREE and get FREE shipping! It’s worth it just for that! It’s only $99 a year! Just to offer the same comparison, imagine you get Netflix and Hulu. This alone is costing you up to $16 a month. 16 times 12 is nearly twice the $99. Even if you are just watching Netflix, you are paying about 20% more than that and you aren’t even getting the selection Amazon Prime offers. Again, there really is no hidden costs, or tricks here. You can get a FREE 30 day membership and it really is FREE. You will not be charged unless you decide to keep it and you can cancel at any time during the FREE 30 day trial! So Hurry and give it a shot!